 The President's New Freedom Commission on Mental Health is committed to providing access to our web pages for individuals with disabilities, both members of the public and Federal employees. To meet this committment, we will comply with the requirements of Section 508 of the Rehabilitation Act. Section 508 requires that individuals with disabilities, who are members of the public seeking information or services from us, have access to and use of information and data that is comparable to that provided to the public who are not individuals with disabilities, unless an undue burden would be imposed on us. Section 508 also requires us to ensure that Federal employees with disabilities have access to and use of information and data that is comparable to the access to and use of information and data by Federal employees who are not individuals with disabilities, unless an undue burden would be imposed on us. (Information about the regulations governing the accessibility of Federal electronic information is available on the Access Board website, at http://www.access-board.gov/508.htm). The Mental Health Commission website includes several features to improve accessibility for users with disabilities. However, if you use assistive technology (such as a Braille reader, a screen reader, TTY, etc.) and the format of any material on our web sites interfere with your ability to access the information, please contact us for assistance. To enable us to respond in a manner most helpful to you, please indicate the nature of your accessibility problem, the preferred format in which to receive the material, the web address of the requested material, and your contact information.